The hornworts include ~300 living species (e.g., Duff et al., 2007) and differ from mosses and liverworts in the nature of their spore dispersal, which is accomplished by a longitudinal splitting of the capsule into several valves along with the action of pseudoelaters. The capsules (sporangia) characteristically have a central column of sterile tissue, called a columella. Hornworts produce symmetrical spermatozo-ids, and on the ventral surface of the gametophytic thallus are specialized, apically derived mucilage clefts surrounded by two cells resembling guard cells. Some authors have considered these homologous to the stomata which occur on the sporophytes (Renzaglia and Vaughn, 2000). 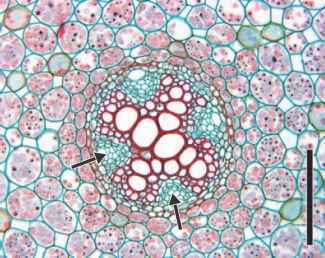 In most genera, cells typically have a single, cup-shaped chloroplast (with pyrenoids) that is reminiscent of the chloroplasts seen in some green algae (Frahm, 2001a). There are no reliable reports of fossil hornworts prior to the Cretaceous, although they have been variously implicated as the oldest extant lineage of land plants (e.g., Renzaglia and Vaughn, 2000). The earliest macrofossil that bears some resemblance to a modern hornwort is perhaps Dendroceros victoriensis from the Lower Cretaceous Koonwarra Fossil Bed in Australia (Drinnan and Chambers, 1986). Morphologically it appears to be a sporophyte arising from a thalloid gametophyte. Another fossil that has been assigned to the hornworts is Notothylacites filiformis from the uppermost Cretaceous of Bohemia (Nemejc and Pacltova, 1974). Frahm (2005) noted, however, that this fossil displays a midrib, which does not occur in modern Notothylas, and thus may represent a Riccia-like thallus instead. Additional evidence of Cretaceous hornworts occurs in the form of spores. Three types of spores have been described from Maastrichtian (latest Cretaceous) rocks and compared to the extant genus Anthoceros (Phaeoceros) (Jarzen, 1979). All are trilete, circular, and possess a distinct cingulum; ornamentation is variable among all the three types. Other spores referred to the hornworts come from the Neogene of Hungary (Nagy, 1968) and Cenozoic from elsewhere in Europe and other sites (e.g., Lacey, 1967); these have been assigned to Phaeocerosporites, Rudolphisporis, and Saxosporis, morphogenera defined to accommodate spores that appear similar to those of extant hornworts. Several macrofossils assignable to the Anthocerotophyta have been recorded for the Cenozoic. The most complete representative (Frahm, 2005) is preserved in Dominican amber of early-middle Miocene age (Iturralde-Vinent and MacPhee, 1996). The specimen consists of a thallus segment (3mm X 3.5mm long) bearing several cylindrical, hornlike sporophytes, which are similar to those in the Dendrocerotaceae (e.g., Dendroceros or Megaceros ). Another fossil with possible affinities to the hornworts is Shuklanites deccanii from the uppermost Cretaceous Deccan Intertrappean beds exposed at Mohgaon Kalan village, Madhya Pradesh, India (Singhai, 1973). This specimen represents an isolated, 1.5 mm long, pear-shaped sporogonium (the sporophyte generation in bryophytes and hornworts), which consists of a short, bulbous foot and an elongate capsule containing thin-walled, trilete spores and abundant filamentous structures interpreted as pseudoelaters. A central columella, however, which is characteristic of most extant hornwort capsules, is not present. Two isolated sporo-gonia reminiscent of those in the extant hornwort Notothylas were also described from the same locality (Gupta, 1956; Chitaley and Yawale, 1980). Another interesting bryophyte from this site is Krempogonium mohgaoensis, an enigmatic fossil (5.5 mm long) composed of a twisted stalk and an oval capsule (FIG. 5.7), containing 10 vertically oriented spore sacs that are separated from each another by parenchyma-tous septa (Nambudiri et al., 2003). The spore sacs contain numerous small (25-30 pm in diameter) spores andpseudoe-laters. The distal half of the capsule is covered by a smooth calyptra-like structure. Krempogonium mohgaoensis is interpreted as a bryophytic sporophyte that contains a mosaic of features seen in extant hornwort, liverwort, and moss sporophytes.